Twenty-two-year-old marketing major Nathan Yamaguchi represented Chandler-Gilbert Community College (CGCC) with precision and pride at the 2017 US Indoor National Championships placing first in the Collegiate Sr. Male Recurve division. Nathan was one of about 140 collegiate archers competing on March 4-5 and he pulled from a quiver full of experience to come out on top again. Nathan was eight-years-old when he first picked up a bow and arrow and quickly showed prominence on a national stage. “I won my first National title when I was 13, and then won my second at 14,” he recounted. “I have been a member of multiple national teams and a few Youth World Championship teams. 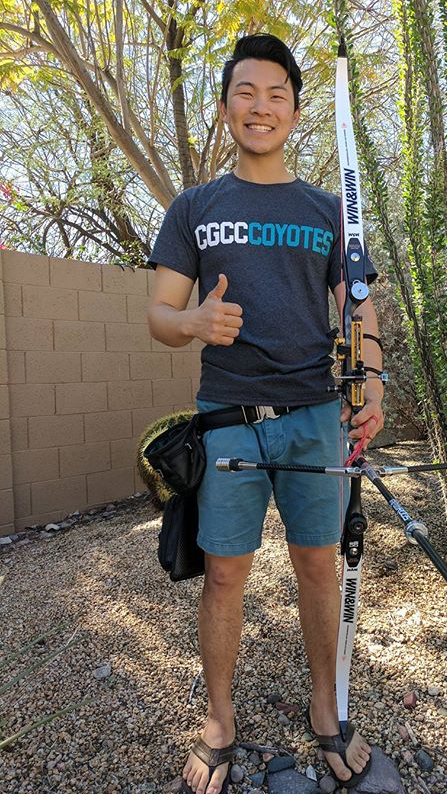 Most recently, I won a silver medal at the Jr. World Field Championships in 2014.” The tournament win this March is Nathan’s first National Champion title since the age of 14 and he is thrilled to have done it at CGCC. If baseball is a game of inches, archery is a game of millimeters. Archers shoot at a 40-cm target, which is divided into 10 scoring rings at 18 m (about 60ft). At the competition, they shoot a total of 120 arrows over the course of two days with each arrow being scored out of a possible of 10 points.